After finishing the third session on this copy, I went home and thought a lot about this painting and how I wanted to proceed for the next session. Between the painting sessions, I spent time thinking about how I would begin my next session and also trying to figure out how to accomplish the soft and layered quality of the sky. When it was time to came back to the gallery, I arrived with an action plan. With the beginning of the fourth painting session, I pulled out my oil cup and poured out the first medium I planned on using for this layer of the painting. My goal was to get through the first "refining" pass through of the sky. I wanted to begin to introduce the more soft and subtle effects of the sky and clouds. I also needed to shift the colors some and lighten the values also, so while I was working on the clouds I was also laying in a new sky color, so the entire area of the sky got a new coat of paint. Occasionally I will lay in a big splat of paint in a location to help me key my values correctly. This is what the large white square of paint is doing in the photo above. The clouds are full of colorful passages. Pinks, purples, yellows, and muted oranges are all present in these clouds, however I am constantly striving to lay them in softly, like Whittridge did, where my tendency is to hieghten the contrast when painting skies. I did not get the entire sky complete, I left the lower left-hand clouds untouched because when I work those, I will also need time to work the rocks and hills also. When working on a copy, the thing I am constantly being reminded about is that painting with oils is a process, one that needs to be thought out and the sequence of steps planned for. With Worthington Whittridge’s Second Beach, Newport, this is something that I have had to just accept and try to figure out how to plan the sequence of actions. During the first session, I realized that this painting for its seemingly direct sense, was in fact a very developed and multi-layered composition, where Whittridge used many layers of paint, with different textures, and often mixed with medium. 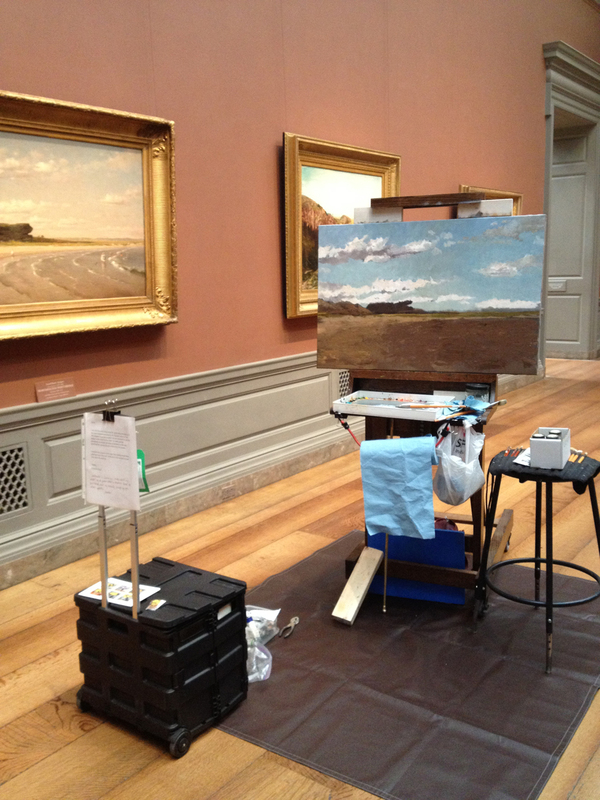 Armed with this knowledge, the first thing I did during my second session at the NGA was to get out a palette knife and squeeze out a lot of paint. I needed to add an under layer of texture to the water area. I laid in paint heavily with the palette knife to create a sense of ripples with the paint that would set up for when I return for the third painting session. I anticipate that when I paint over this sculptural layer some of the ridges will become subdued with the successive paint layers, and hopefully will resemble the effect of rippling sand under water. For the sky area I also worked to build up texture where the cloud formations were. For both areas I used some of my precious Old Holland Cremnitz white (because a big tube is more than $100.00 from DickBlick) because it gets so thick and sets up faster than the Blue Ridge Cremnitz white that I now predominately use. (as an aside, Old Holland is still the zenith for Cremnitz white because the more you work it, the more creamy is becomes, but it also sets up fast. I liken it to being stiff like cold cream cheese at first, but as you work it, is becomes smoother and more malleable, but once you lay the paint down, and if you leave it alone, it will set up and become stiff again, back to how cream cheese is when still from the block. So you can lay paint on top of it in a few hours, and this is all without using any medium or additive). I needed the areas that were laid in during the morning to be stiff enough for a second round of building up the texture later in the afternoon. You see, this is where the process of planning is so important, by making decisions on how to proceed in the morning that would affect my ability to do certain things in the afternoon. This is where also understanding your paints is also very important because it allows you to be able to plan and in your mind work out problems that may arise. Often when I begin a specific copy I will do some research on the artist I am copying, this involves learning about the specific techniques and color palette he may have used, but it also includes diving into the ideas that informed him as an artist. In the first post about my current copy, Second Beach, Newport by Worthington Whittridge, I shared how he was of the Hudson River School (HRS) of painters, but by the time this particular painting was created the Tonalist sensibility had begun to pervade the arts in America, especially those of the landscape. So this painting, a simple scene, is created within a rich milieu of thought and practice. Three great references for better understanding this era of American art are 1) William Kloss’ DVD lectures on American Art, 2) the book, A History of American Tonalism , and 3) the book, The Hudson River School … Probably the most entertaining of these are the 30 minute lectures by William Kloss, he weaves in the political and social history of the US and how these occurrences influenced the artists, I especially love how he reads the poetry that can sometimes be directly related to a painting. Typically my ability to research ends with the books, lectures, and personal observation, however for this copy I am fortunate that the NGA also happens to have a special program, the Drawing Salon, and that this February covered the Hudson River School: Tone, Light, and Atmosphere. This program included some lecturing on the important ideas that informed this group of artists and some time to sketch in the gallery. The main thought that was conveyed was that the artists of the Hudson River School believed in the ability of the American landscape to elevate the viewer, that the emotive quality of landscape paintings had and could inspire the viewers to feel more whole and connected with the potential of the United States. Thomas Cole, considered the founder of the HRS, wanted to use landscape art to look at the present and into the future, inspiring something more, elevating those who viewed his work and to inspire greatness in their actions. During the Drawing Salon, I chose to sketch the painting, The Lackawanna Valley by George Inness, an artist more associated with the Tonalists than the HRS, so I thought it would be fitting to analyze his painting. This painting was a commission from a railroad company that wanted to feature the new round house built by the company and to highlight the progress made by expanding the track. If you look closely, you will see that the foreground field and the middle ground fields are dotted with tree stumps, all cut down in the name of "progress" and George Inness portrayed this as not such a great thing in the name of progress. I was fascinated at how atmosphere was presented in this painting, the lightening of color saturation and how other than the foreground tree it was only the man-made smoke that had the highest contrast. Making it totally felt that man had a strong presence in this valley. 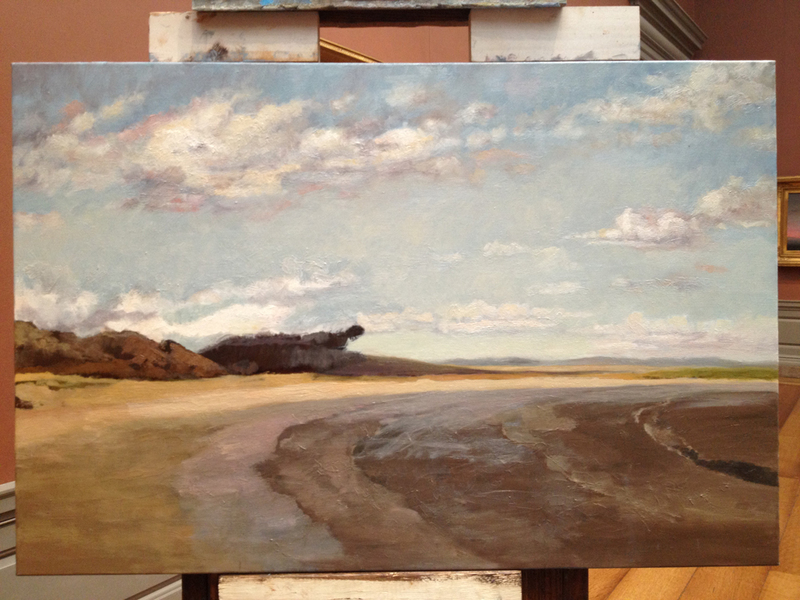 Next week I will share how the second painting session of working on my copy, Second Beach, Newport progressed. Until then, if you would like to learn more about where I started, here is my post about the first painting session.